We are making plates! We worked on designing classic plates, and have been building up an inventory of them. We used to take orders for dinnerware sets but sometimes customers had to wait a year to get their pieces. Now, when people decide they want a set from us, there is a good chance they can leave the gallery with their pieces. We’ve standardized our designs and our glazes, so people can build sets over time. Pieces purchased this year will all coordinate with pieces purchased in future seasons. Our dinner plates are 11” in diameter ($36) and our luncheon plates are 9” in diameter ($32). In addition, customers can also choose bowls. mugs, tumblers and a variety of serving pieces to round out their sets. We also have wood-fired plates available. Each of these is more one-of-a-kind, but all of the glazes work so well together they can be combined to make really distinctive sets. Please come to the gallery and work with us to build your special dinnerware set. 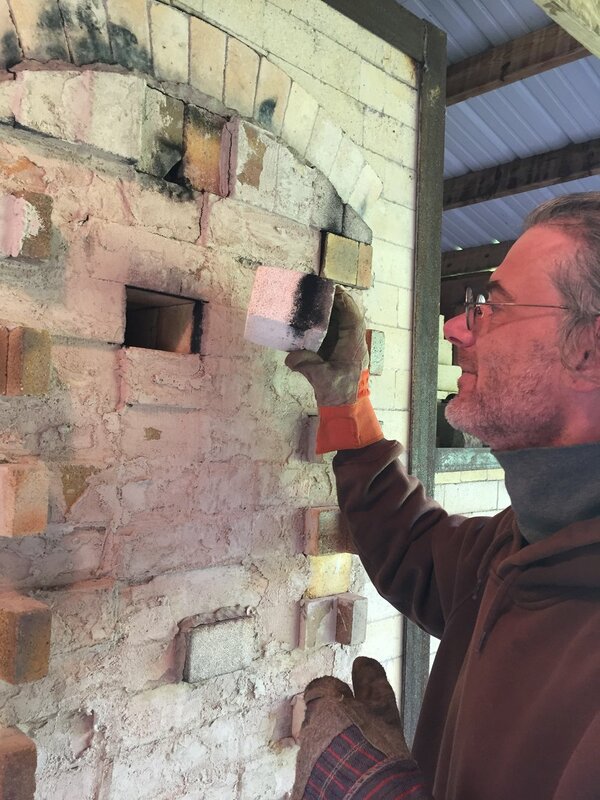 We will be unloading our wood-fired kiln on Thursday, June 14. The pots will be available in the gallery beginning Friday, June 15. Wood is the traditional fuel to fire pottery and right now the we are the only potters in Door County firing with wood. Our wood kiln is a two-chambered, catenary arch kiln that holds about 500 pots. During a firing the kiln is stoked every 5-7 minutes, around the clock. The firings last about 30 hours and the kiln reaches a temperature of 2400º F. The prolonged heat, ash accumulation, and kiln atmosphere produces a rich, varied, and somewhat unpredictable surface that can be achieved through no other method. We know what is in the kiln: mugs, vases, plates, bowls; the functional shapes that make up the bulk of our work. But unloading the kiln always provides some surprises. What do the glazes look like? How did the flame move though the chamber? What marks did it leave on the pots? How much ash accumulated onto pieces? Discovering those answers is what is exciting about kiln openings.